Good evening everyone, I hope you are having a fabulous day. I know I am. My boys have been playing in a pre season basketball tournament the last couple of days and I have been running home between games to work on a card. I promise you don’t want to miss this one! 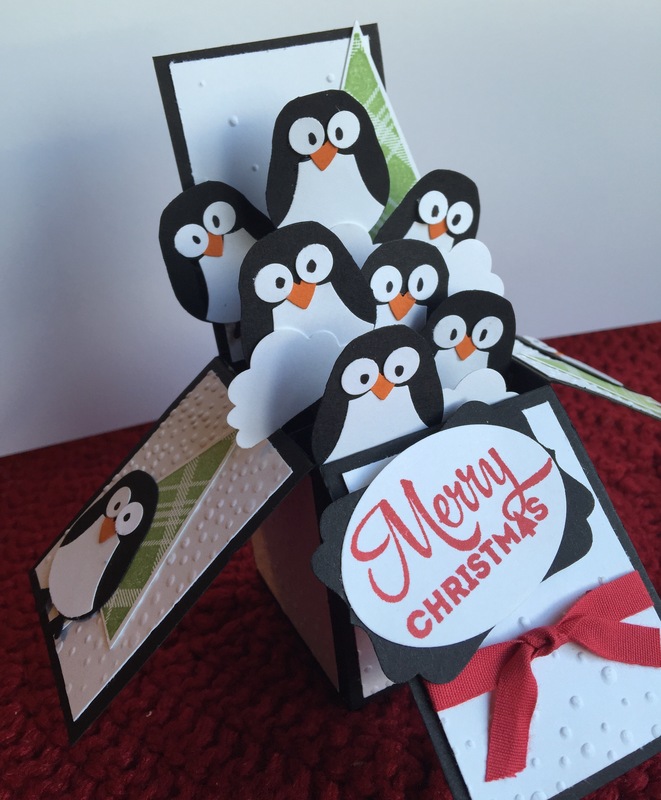 I don’t know how I missed the train with these adorable box cards but they are so EASY to create and look incredible. 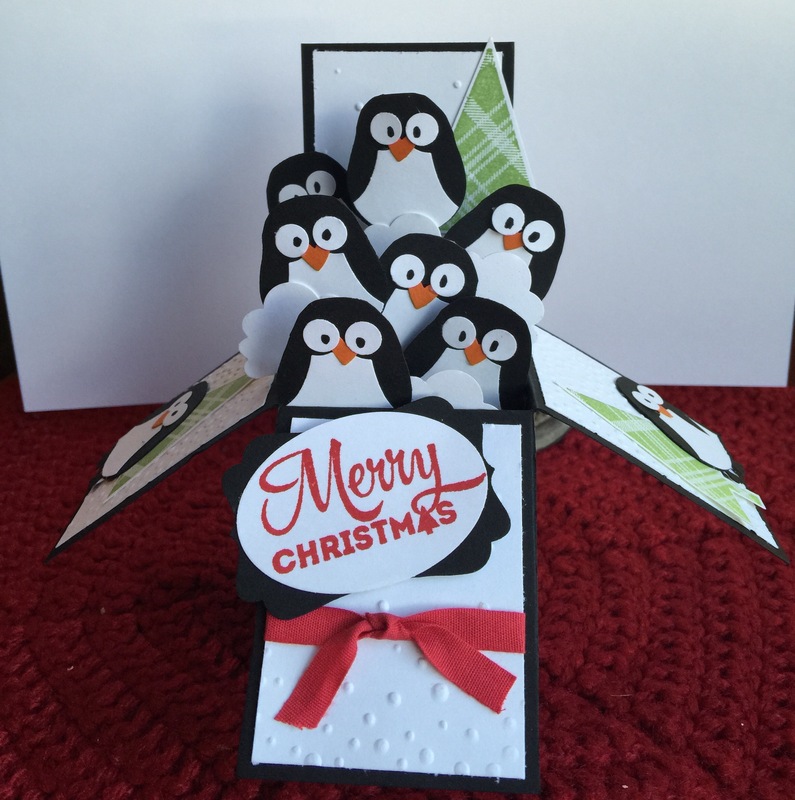 I can’t wait to teach this card in a Christmas class so please let me know if you are interested. I found the inspiration piece browsing Pinterest last year and never got around to trying it till this year. Anyone with me out there? I know all my crafty friends try everything you pin right? Here is the inspiration piece which I used as a launching point and a really awesome blog to check out while you are there. The YouTube tutorial is an excellent video that shares all the details and measurements to create an exploding box card. Know what makes these cards even more awesome? They fit in a normal A2 envelope! That’s right folks, you don’t have to buy or make a different size envelope for this card. I like Stampin Up’s envelope punch board but sometimes I just like to grab an envelope and go. I guess I get a little lazy sometimes. Especially around the holidays when I am in a time crunch. 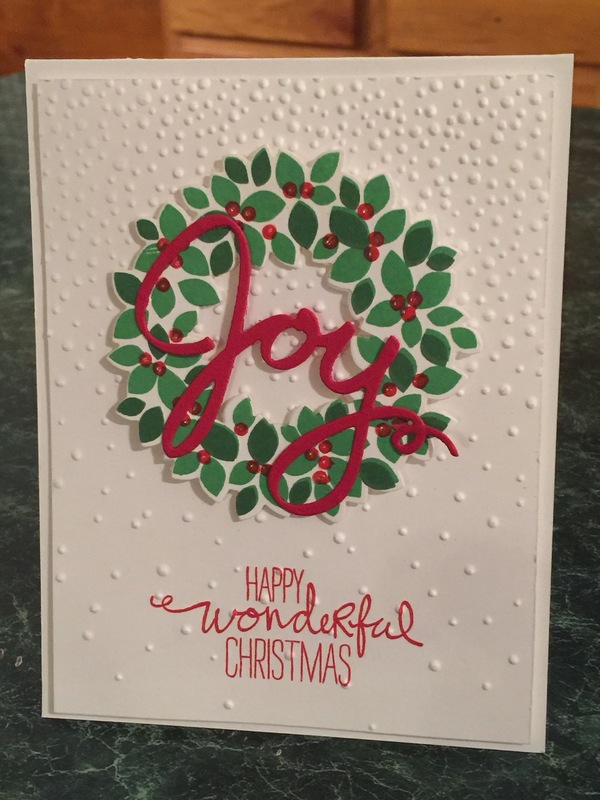 I mixed it up and used an array of products on this card. It uses the owl builder punch, tree punch and cupcake builder punch from the annual Stampin’ Up catalog along with the Lots of Joy stamp set. I love that Stampin’ Up included holiday stamps in the annual catalog this year. 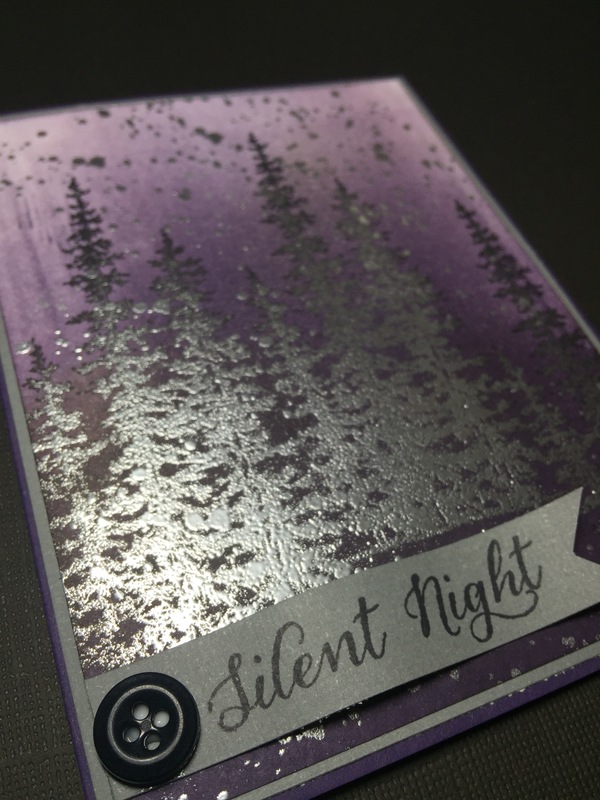 I used the Softly Falling Textured Embossing Folder from the holiday catalog and I must admit I adore the new 6″ X 6″ size. It’s so versatile! Square cards anyone? I kept the color palette really simple using only Basic Black, Whisper White, Real Red and Wild Wasabi. I think it keeps it really crisp and clean. I debated whether to ink the edge of the Merry Christmas sentiment but in the end I just popped it up with a couple of dimensionals. I hope your not tired of all the photos because I really wanted to include a top view. 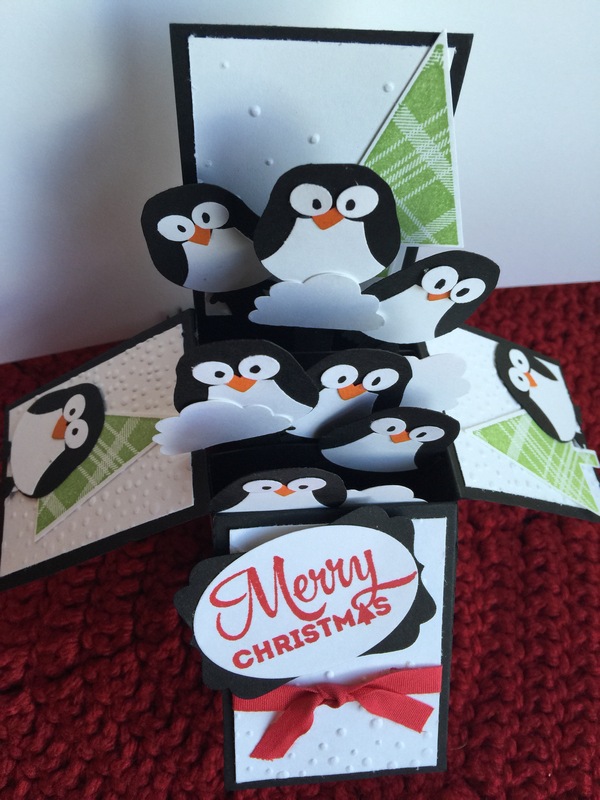 I think the cupcake builder punch made really great mounds of snow and gave the card a little more dimension. I finished it off with some Real Red ribbon and tada you have a Christmas card that will impress even the most discerning family member. You made that? Of course you did! Last but not least I know you want to see a picture of my athletic son right? That’s Trevor number 54. 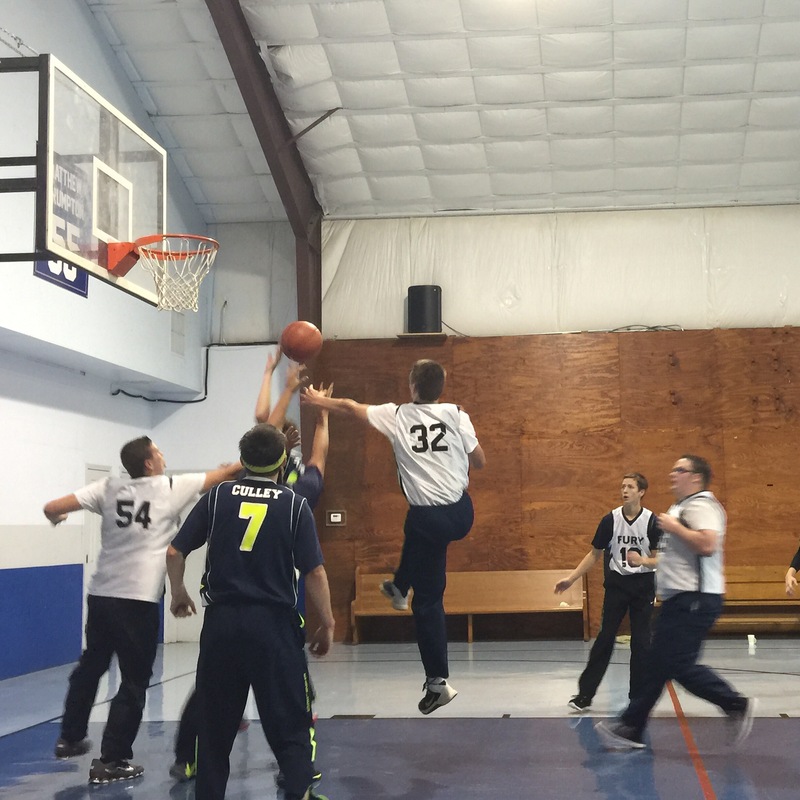 He has been a rebounding machine the last couple of days and I’m really proud of him. Of course while attending the tournament I got to visit with one of my best friends Tiffany Aaron. She is an amazing baker and maybe I can talk her into sharing some of her delicious cookie recipes on the blog sometime. Greetings everyone! I’m excited to show you something a little different that I worked on yesterday. As I stated in a previous post I have a lot of elegant eggplant cardstock left from a bridal shower I hosted a few months ago and I want to use it for some non traditional Christmas cards. This is one of the cards I created. The card base is elegant eggplant with a thin whisper white mat. I used whisper white for the the stamping also. I punched a 1 3/4 inch circle mask and adhered it in the upper right corner using a temporary adhesive. 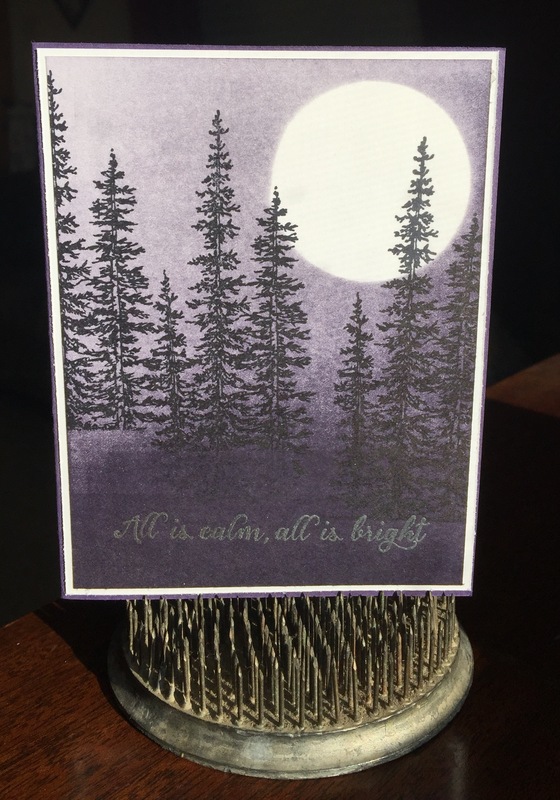 Using a brayer and an elegant eggplant stamp pad I turned the mat sideways and rolled and lifted the brayer after each swipe moving slightly left each time. Cover the entire piece bottom to top. Blending is key here. You do not want stripes. Remove your circle mask to reveal the moon. Be careful not to smear the ink, it’s easy to do. 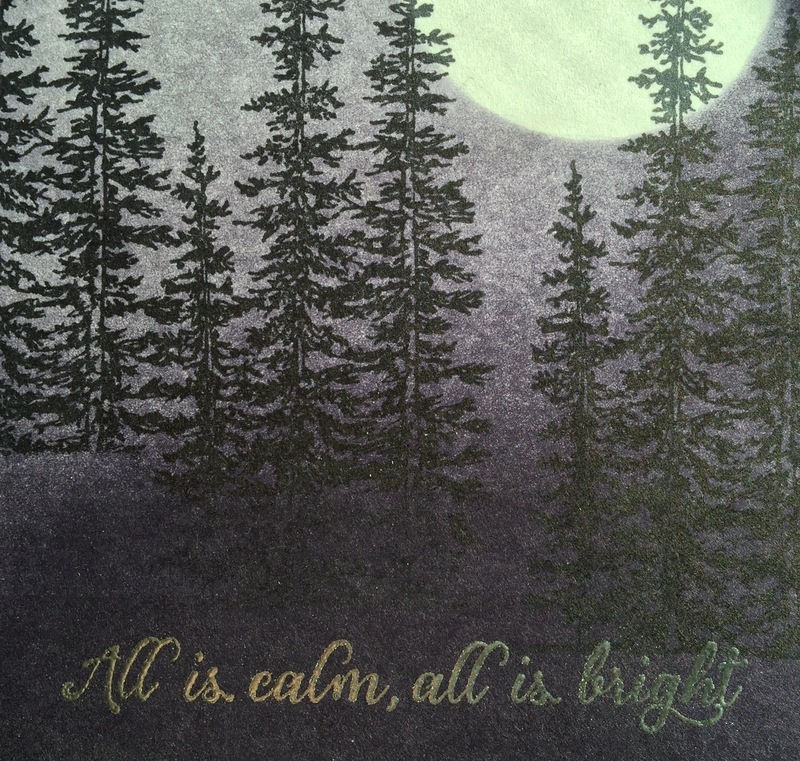 Use archival black ink to stamp your trees using the wonderland stamp set. Stamp the sentiment on the bottom center with versamark. 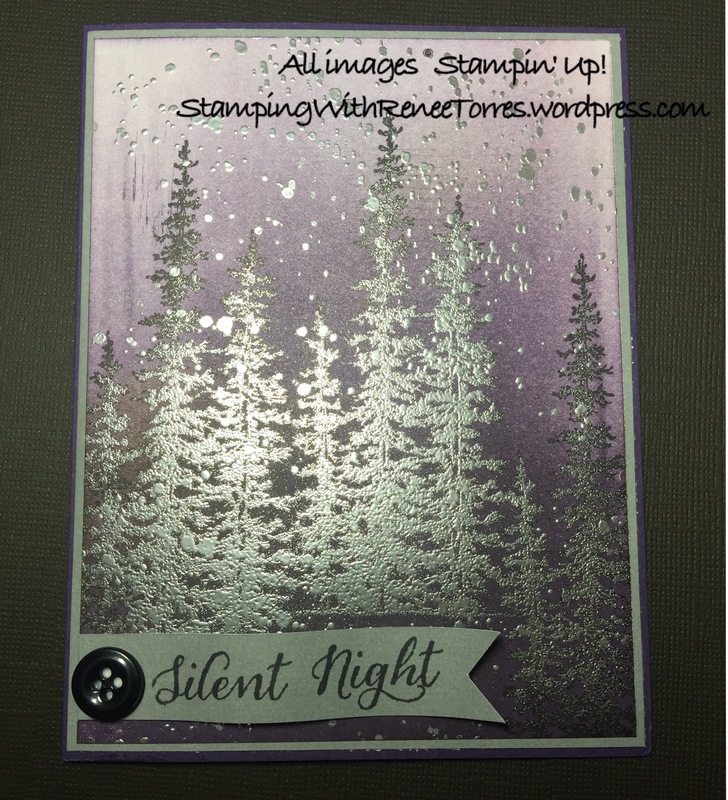 Sprinkle with silver embossing powder and tap off the excess. Use a heat tool to set and voila your done! 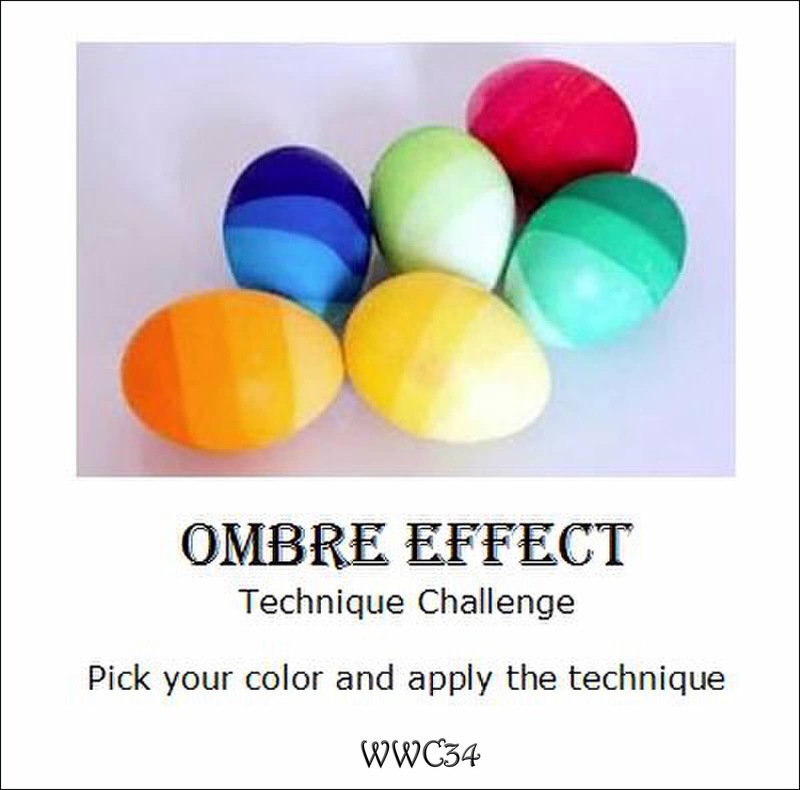 I’m using this card in the Watercooler Wednesday challenge. This was a new technique for me and I had fun experimenting with it. I can’t wait to see what all the fellow papercrafters submit. I’m new to challenges but am enjoying playing along with everyone. Good morning everyone! I hope your day is off to a fabulous start. I know mine is. I got to spend a few minutes in my craft area before work today and this is what I came up with. I was pondering how to use up some supplies that I had for Christmas cards in some non traditional colors. I’m usually very traditional when it comes to Christmas, but I have lots of Elegant Eggplant cardstock left from a bridal shower I hosted a few months ago that I need to use. 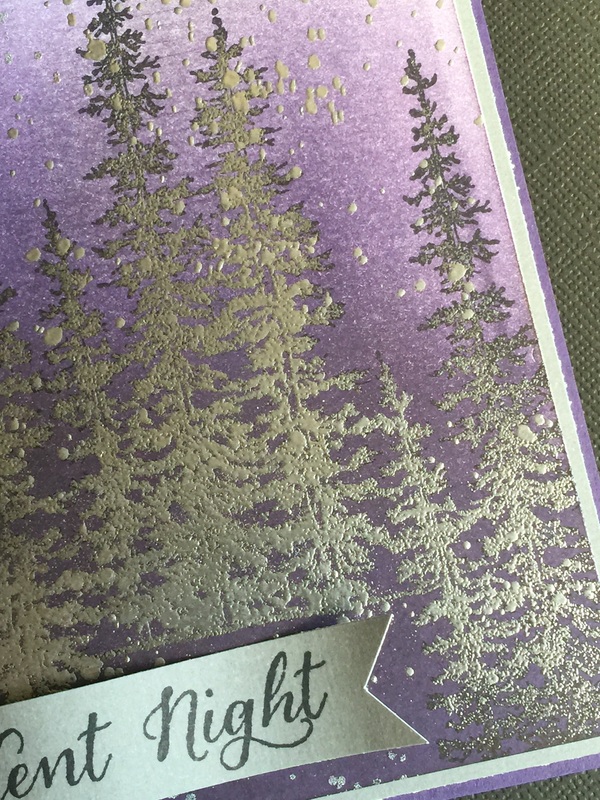 I got to thinking about the smoky purple haze of mountains in the distance and thought that effect would make a beautiful card. 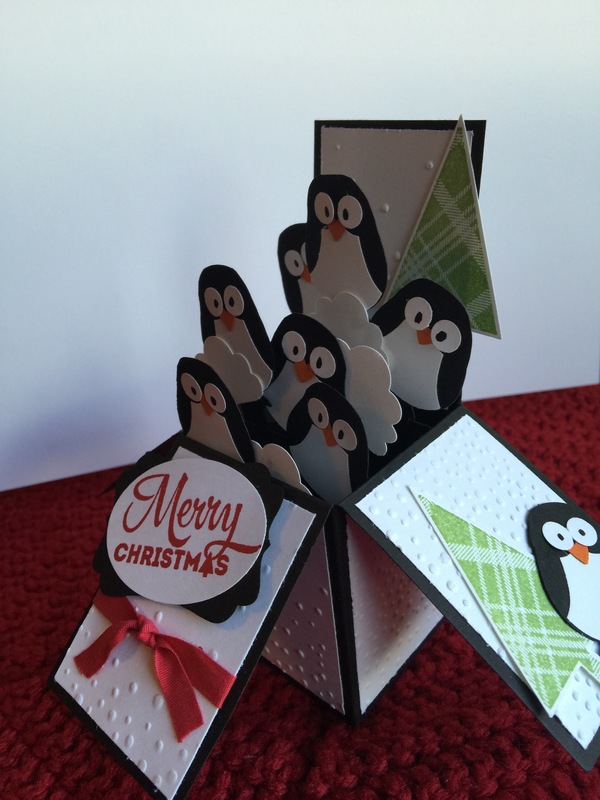 Add in the trees from the new Wonderland stamp set and you have the perfect snowy mountain scene. The trees remind me of a trip to Pikes Peak this summer and I can’t wait to use them on a scrapbook layout.